Can't stand that song. Air man is a joke. Even in the Japanese version. Now we have a bunch of people who never even played the game going "AIRMAN IS SO HARD'. And then three panels later, Air Man is dead. Am I missing something here? Since when was Air Man so difficult to beat? He's EASY. I don't think "Airman is a mediocre fighter" would make for as catchy as a song. Some one who really sucked at Mega Man games wrote a song in Japanese about he couldn't defeat Air Man and people just ran with it. It's obnoxious really. Yeah especially given the next issue is supposed to feature FOUR Robot Masters I doubt Air Man's gonna live through the next page. Oh, thank God I'm not the only one who thinks so. A few years ago, I remember someone claiming that Air Man's difficulty as a boss was watered down in the American release of Mega Man 2, so I decided to download a Rockman 2 ROM and see for myself, and that turned out to be entirely untrue. In fact, I was able to defeat him with just the Buster in only a matter of seconds. Hey, cynical people. Ever think that maybe some people aren't so great at Mega Man? I know people who can't beat Top Man. Yeah, TOP MAN. The tune is catchy, especially the later remix, with some really awesome animation. It's a neat piece of the Mega Man fandom. Also, Nick Phaelin is correct. Ben Bates is, in fact, a badass. That would explain why Top Man is the last boss defeated by Mega Man in Captain N.
I'd Believe Proto man. Maybe even Rush. Who else would it be? Ballade? Actually, Enker would be cool! I love all the nods in this comic series. Yeah, Air Man was easy to me, even as a child, but I still love that song. Ben Bates art is badass!!! Actually the battles of issue 10 were pretty awesome, the battles last longer and megaman is taking a lot of damage, much better than the first two arcs, I hope is the same for this issue. I wouldn't believe it if it was Protoman. It'd strain the plot to the third game arc. I'd believe it if it was Roll, with just a broom or a combat armor upgrade. I'd believe it if it was any partner pet/character, or any of the MM1 Masters. 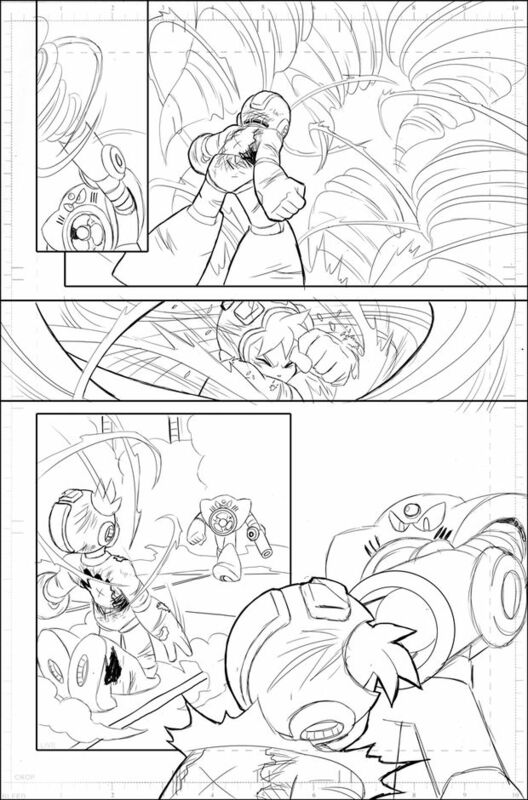 I'd believe it if it was Bondman and his existance here is only to show that Megaman is only able to narrowly best Quickman through the application of specialty defying glue attack that'll never work again in a million years. I'd like to believe it's Bass rather than any of them, especially Protoman. Hum a few bars about how Wily had Burst/Junk/Cloud/Freeze prepped as a backup plan or just show them in the background of Wily's lab at some point. Then when whatever's got Megaman on the ropes at 11:00? Have Bass pop up out of nowhere. Come on people it's obvious the ones helping megaman are going to be those federal agents from the second arc!